Die Shop Equipment – Manual Equip Misc – AmeriKen Online! 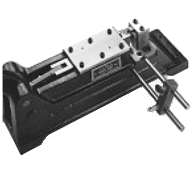 This machine is designed for accurately cutting steel rule to length and is extremely powerful. It’s rigidly constructed and wil cut 6 pt. tempered rule. Available in cutting heights of 1-1/2″, 2-1/8″,and 2-7/8″, it’s equipped with front and rear gauges graduated b sixteenths. The front short gauge allows a cut of 6″ and the long back gauge allows cuts up to 24″. The knives are easily removable for sharpening. 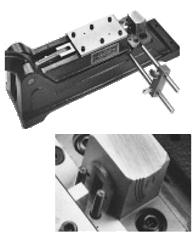 The Standard Notcher is used for notching or bridging rule and is. designed to easily notch 2pt rule and can also notch rule up to 3pt. It’s equipped with an adjustable link that allows male knives to be re-set and adjusted after sharpening. This is an excellent starter tool and a great second machine when you have to notch large quantities of rule at one time. 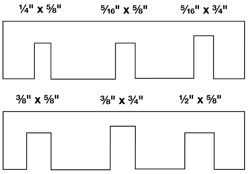 Standard notch sizes for this tool are 1/4″ x 5/8″ and 5/16″ x 3/4″. Special sizes can be made to order. 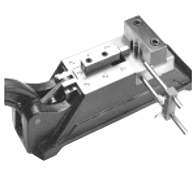 The Helmold Heavy Duty Notcher is a variation of the Standard Notcher but is designed to easily notch 3 and 4 pt rule. It can also handle soft creasing rule up to 8pt and tempered steel up to 6pt. The notcher is equipment with an adjustable link that permits setting up the knives to just pass each other, ensuring that the maximum power is developed. Stripper pins are provided to strip rule from the male knife. Choose either a standard 2-hole female style or special 4-hole female. 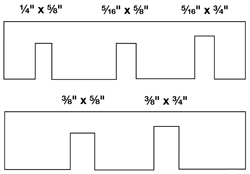 The 4-hole allows more flexibility in notching smaller radius bent rule that would ordinarily hit the larger 2-hole block. (Special sizes can be made to order) 4-Hole Female house works with pre-bent materials. The small housing makes it a versatile and necessary tool for most die shops. The E-Z Heavy Duty Notcher has a toggle handle design that gies far greater working force for your effort. The E-Z handles also have ergonomic, variable hand positioning that accommodates any working height and angle you personally find comfortable and convenient. The notching mechanism has been redesigned so you can re-sharpen and re-use male and female knives many more times, and still achieve perfectly aligned bridges. With just a twist of the bolts, you can remove the knife for sharpening and reinsert the sharpened tool. The E-Z Heavy Duty Notcher comes with either a 2-hole or 4-hole female house. (See the specifications for the standard notch sizes and houses on the heavy duty version above). 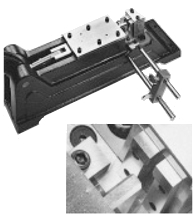 The 2-hole version is designed to easily notch rule up to 6pt hard, 8pt soft or rotary rule. The 4-hole version will easily notch 2, 3, and 4pt. rule and works with pre-bent materials. 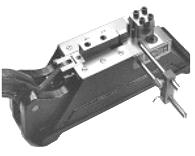 The small housing on the 4-hole style make it a versatile and necessary tool for most die shops. 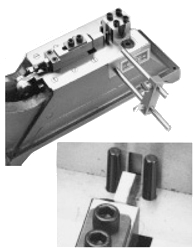 In order to guarantee that the edges of your cutting rule will meet and that no diecut material is left hanging, you need a Helmold Miter Machine. It is not necessary to change blades for different thickness rule with the machine, but shims are required for rule over 2pt and under .937″ high. The width of each female knife must be kept at .310″. As the female knives are sharpened shims are required between the sides of the female miter house and the outside vertical edges of the female knives to hold the .310″ dimensions. Save time and effort by mitering two ends at once. When mitering bent pieces of rule, it is sometimes desirable to nmiter from the opposite end of the formed piece. 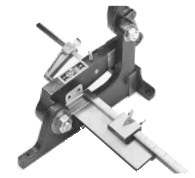 The Right and Left Hand Miter Machine can miter two ends at once, eliminating the extra steps involved in cutting lengths on a cutter, trimming one end of the miter, and setting up once again to trim the other end. It also allows mitering of small lengths on both ends with ease.